Feeling tired and icky could be a sign of trouble. Mammary tumors are just as dangerous in cats as they are in humans. While you probably think of female cats when you think of breast tumors, the truth is that boys also are at risk. Keeping an eye out for symptoms and treating the problem quickly is key to survival. Mammary tumors in male cats are very rare. According to an article published in Veterinary Medicine, less than one percent of cats diagnosed with mammary tumors are male. Although cats of all ages can suffer mammary tumors, they are more common in cats over 10 years of age. About 90 percent of mammary tumors -- counting female and male cases -- turn out to be malignant. According to WebMD Pets, mammary tumors seen are more commonly in cats that have not been desexed. In male cats, the risk of breast tumors developing increases when the animals received progestin treatments. 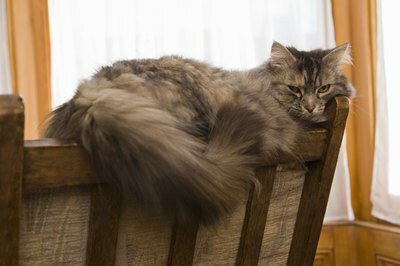 Progesterone therapy sometimes is used to treat skin conditions in all furry creatures, including cats. According to a study published in the "Journal of Veterinary Internal Medicine," 36 percent of cats diagnosed with mammary tumors had a history of progestin treatment. The "Journal of Veterinary Internal Medicine" study showed that male cats tend to have mammary tumors at a slightly older age than females. Many cats show signs of illness long before you can see the tumor in the breast area. Signs to watch for include weight loss, loss of appetite and lethargy or apathy. The chances for survival in male cats depends partly on the size of the tumor and how much it has spread. Tumors that have reached the lymphatic system have a poorer prognosis than those that are located just in the breast area. Mammary tumors are very aggressive in male and female cats. Can Cats Become Depressed When One Dies? Do Cats Get Cardiac Myopathy?